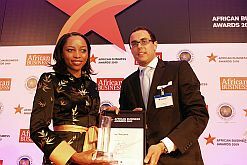 In July 2010 Diageo, the world’s leading premium drinks business, will hold the seventh annual Diageo Africa Business Reporting Awards, which recognise recognise journalists from around the world who have excelled in reporting accurate and unbiased news about the continent. Initiated in 2004, the awards encourage prolific business journalism within Africa with their focus on increasing the continent’s influence in the international media. The awards will recognise journalists who have helped shape opinions and create an enabling environment for business in Africa to succeed. “The world has been impacted by the global recession and so has Africa. However, the dynamism of doing business across Africa and the opportunities available to investors, continue,” said Nick Blazquez, the company’s Africa Managing Director. African media is increasingly influencing perceptions of the continent globally and shaping investor sentiment. This is why the best journalists and influential media outlets from Africa, as well as international sources, are being encouraged to enter the awards. The number of categories has also been extended to allow sector-specific categories to reflect the important role that various industries play in economic development. ‘Looking ahead, 2010 is a very important year for African business. As 16 African countries celebrate their 50th Year of Independence and South Africa hosts the 2010 World Cup, there is a greater sense of optimism and excitement than there was last year,’ added Blazquez. The awards ceremony will be held on 1 July, 2010 in Central London. The closing date for entry is 26 March, 2010. Entries can be submitted online at www.diageoafricabusinessreportingawards.com. A feature or series of related features delivered on any media platform (print, broadcast, online) that examines any aspect of the ICT sector in a thoughtful and engaging way. This might include, but is not limited to, telecommunications infrastructure, mobile, networking, security, cyber crime, e-learning, hardware, software, Internet. A feature or series of related features delivered on any media platform (print, broadcast, online) that examines any aspect of the finance/banking sector in a thoughtful and engaging way. This might include, but is not limited to, investment opportunities, retail banking, credit cards, corporate finance, mobile money, payment systems. A feature or series of related features delivered on any media platform (print, broadcast, online) that examines any aspect of infrastructure (physical or otherwise) in a thoughtful and engaging way. Features addressing issues of energy and transport can enter this category. This might include, but is not limited to, infrastructure development projects, aviation, oil, roads, rail, energy. A feature or series of related features delivered on any media platform (print, broadcast, online) that examines any aspect of agribusiness or environmental issues in a thoughtful and engaging way. This might include, but is not limited to, climate change, agriculture, food security, water management, farming, resource management. A feature or series of related features delivered on any media platform (print, broadcast, online) that examines any aspect of the tourism industry in a thoughtful and engaging way. This might include, but is not limited to, hotels, eco-tourism, travel, 2010 FIFA World Cup South Africa™. A piece developed using new media (online digital photography, blogs, vodcasts, videos, podcasts or a mixture of these) that effectively supports a story about business or the economy in an African context. The topic is open, but use of new media must help deliver a fresh perspective that helps the audience engage with a story in a way not possible through traditional media alone. Entry must include a live URL. A news story or series of related stories delivered on any media platform (print, broadcast, online) that: Addresses a breaking news story from the time period of the awards, answers all basic questions in a clear and balanced fashion, and demonstrates journalistic flair – a style that is engaging, though-provoking and accessible to its audience. A feature or series of related features delivered on any media platform (print, broadcast, online) that: Examines business or the economy in an African context, provides useful background material for readers to understand relevance, gives bigger picture and importance to Africa, as well as specific issues it might be addressing and brings the business and economy to life, while answering the serious questions. A print publication, broadcast programme/channel , website or blog that is a comprehensive resource for its audience providing sustained coverage of Africa’s business and economic news, issues and analysis (sector-specific or otherwise).Please submit a portfolio of five articles of no more than 5,000 words each, or five broadcast programmes, of no more than 3 hours in total. In addition to quality of reporting, balanced perspective, insight and analysis, judges will be looking for style and presentation, as well as outlets that are building a reputation amongst business and investor communities as a valued source of information about Africa. A portfolio of three features (on any one or a mixture of media platforms) of no more than 5,000 words or 1 hour each. Submitted pieces can cover different topics, industries or people, or be part of a series of reportage. As well as quality, style, presentation and a way of engaging the audience, judges will be looking for a commitment to sustained coverage of the business and economic climate in Africa which serves to highlight opportunities as well as challenges.